The species is widely distributed in Britain, but with few records in the west, south-east and large areas of the north. It is widespread in western and central Europe. S. cingulatus occurs on old tree trunks and fence palings in sunny situations in or near woodland, fens and heathland where it may be frequent on pines. Males are found in May and June, females mainly between May and July, but occasionally persisting into the autumn. Local. 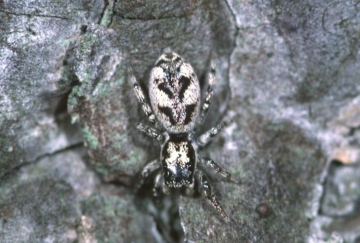 The spider may be frequent in suitable habitat. It is inexplicably rare in some parts of the country such as Essex.